A so called, non-reusable pepper mill. Using some heat as described in the accompanying article I was able to easily disassemble the parts and refill. There are three parts to this one: the vessel or body (glass), the grinder core (black), and the grinder housing (white). At some point I decided that freshly ground pepper is preferable to pre-ground pepper bought in a tin. Genius, huh? Well, I’m not a foodie. What can I say? As it turns out I was right and the reason is that peppercorns contain volatile compounds that begin evaporating the moment peppercorns are ground and exposed to air. I’ve done the research. Who knows how long canned pepper has been sitting around on the store shelf after its been ground? When you’re eating out at the local dive you’ll find pepper shakers on the tables containing pre-ground pepper. When you’re at a better place wait staff will ask if you’d like fresh pepper ground onto your salad. Fresh ground is better than pre-ground. Nuff said. A few months ago when I ran out of the pre-ground canned pepper I’d been using I was faced with the choice of buying more of that stuff or purchasing a pepper mill and whole peppercorns to grind myself. On my next grocery shopping trip I went looking for pepper mills but I didn’t find anything I wanted to buy. I can’t remember if it was because they seemed a bit pricey or if they didn’t sell them. I did, however, find that the store sold non-reusable pepper mills in the spice isle alongside the salt and pepper. They were small glass bottles filled with peppercorns and had lids fashioned in such a way as to grind peppercorns. Who knew? So I bought one of those for a few dollars thinking that I’d buy the genuine article before I used up the pepper that it came with. Well, I didn’t. It’s not that I didn’t look around for pepper mills, but jeez, have you seen what they cost? 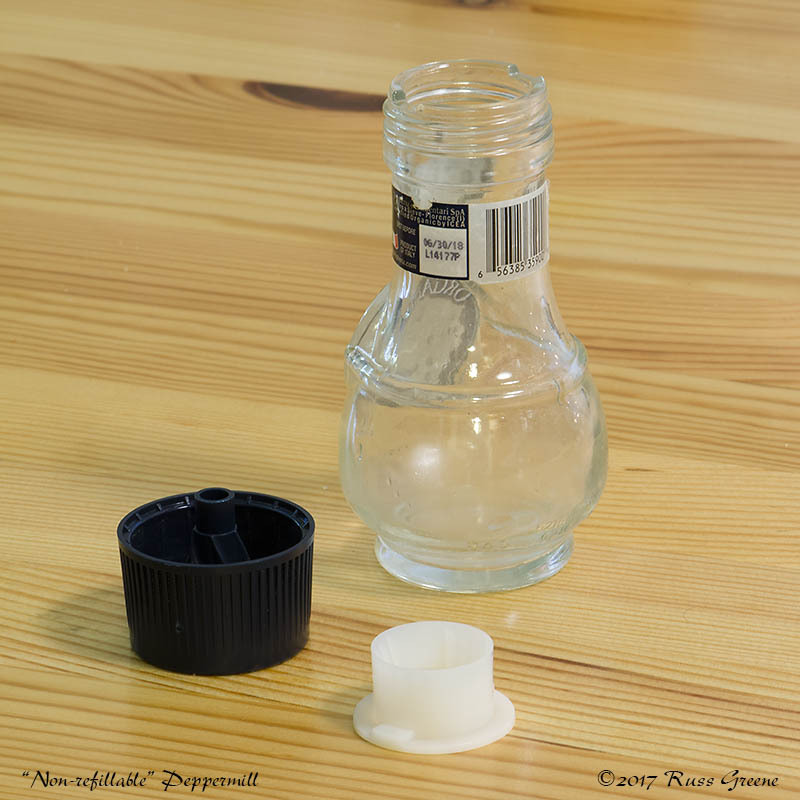 Some weeks or months later I found myself in the position of having to either purchase a real pepper mill or another one of the non-reusable kind–canned pepper was out f the question at this point. In the long run I’m sure it would be more economical to purchase the real deal rather than the non-reusable type because the latter comes with a premium in cost over buying peppercorns alone. Then it struck me… what if I could refill the non-reusable pepper mill? 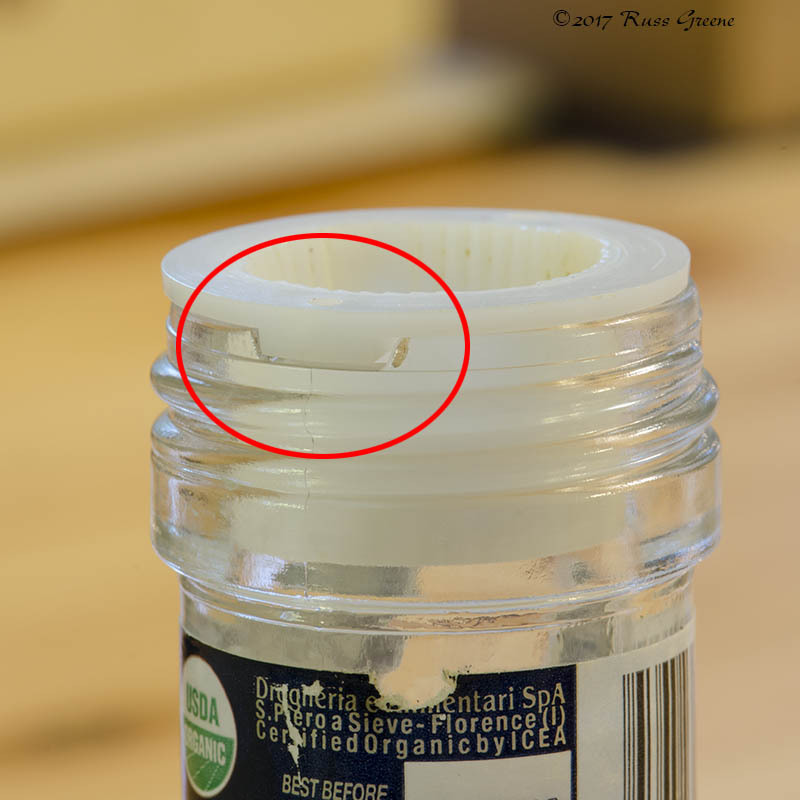 Unfortunately, the one I bought did not have a screw-off lid. I guess that’s why it’s supposed to be non-reusable. Duh! After some Googling and YouTubing I decided it might, however, be possible to refill one of these after all. Various YouTube videos showed different methods of opening the non-reusables. One method involved pulling off the lid (grinder core) using brute force. Apparently I’m not brute enough because that didn’t work for me. I was sure my shoulder would come out of its socket before the pepper mill would come apart. Another method suggested drilling into the cap. Unsafe or not worth the hassle, that’s what I was finding. Eventually I came up with an idea of my own which was to heat the grinder core to see if it softened enough to pop it off the body easily. It did. Once I had used up all the pepper in the non-reusable pepper mill I inverted it, placed it in a sauce pan and poured in enough water to cover the grinder core. I placed it on the stove and when the water was getting close to a boil I lifted the pepper mill out of the water using a dish towel to protect my hands from the heat of the hot glass. With the other hand, again using a dish towel as protection, I pulled on the grinder core and it easily popped off of the glass body. From there it was a simple matter of pouring peppercorns into the container and pressing the grinder core and grinder back onto it. Easy peasy. I cleaned up the bottle and parts before reassembly. There are only three components as you can see by the accompanying photos (click each to enlarge): the body (glass), the grinder core (black), and the grinder housing (white). The body has a couple notches in the lip that mate with a couple protrusions on the grinder housing similar to a tongue and groove arrangement. Look for the red circle in one of the accompanying illustrations. This keeps the grinder housing from turning when the grinder core is rotated. That action of one piece remaining still while the other turns is what grinds the peppercorns. Speaking of peppercorns, there are different kinds. Black, white, and green peppercorns all come from the same plant, piper nigrum which is a vine. Peppercorns are the dried fruit. Green peppercorns are harvested when they are young. They are mild. Black peppercorns have been left on the vine to fully ripen and develop their stronger flavor. White peppercorns are black peppercorns that have been treated to remove the outer casing resulting in a stronger flavor yet. So-called pink peppercorns aren’t really peppercorns as they are from a different plant in the cashew family and they can cause an allergic reaction like nuts! Sichuan peppercorns come from a tree, not a vine like the black, white and green peppercorns. The most highly regarded of the true peppercorns is probably the Tellicherry. I’ve read that these are left on the vine longer to fully mature. I’ve also read that’s not true and they are simply the largest of the black peppercorns when they are sorted by size. The bigger they are, the more aromatic. I don’t know how long my “non-reusable”, non-adjustable pepper mill will last–the parts are plastic or nylon. I’ve refilled it twice so far and it still seems to be working OK. Meanwhile, refilling it has bought me some time toward researching some real pepper mills and I have my eyes on a few including the Cole & Mason Derwent Gourmet Precision Pepper Mill (7.5″ tall) which was top ranked by Cook’s Illustrated, the Peugeot Paris U’Select (10.75” tall) preferred by SweetHome or the OXO Good Grips Pepper Grinder, well rated on many web sites. At 5.5″ tall, the shortest of the bunch, the OXO is a good bet for small spaces and it’s also the most economical of the three to purchase. 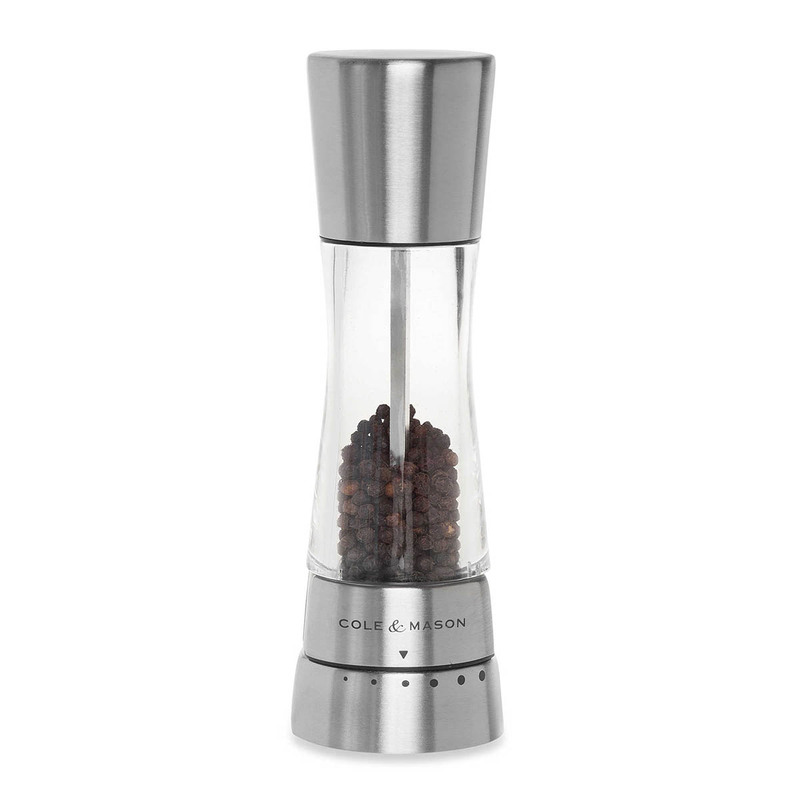 All of these pepper mills have been highly rated on numerous web sites and I expect you’d be happy with any one of them. 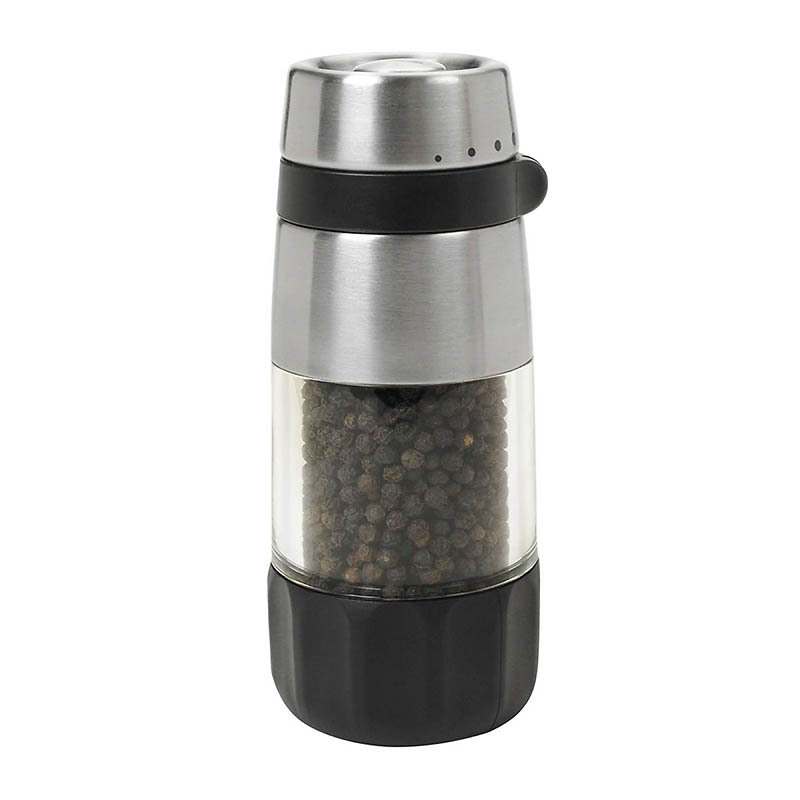 While pepper may make you sneeze, choosing whole peppercorns over pre-ground, paired with a good quality pepper mill is really nothing to sneeze at.